These days one of the most common issues is vitamin deficiencies, and these deficiencies are very likely to be the main cause for more serious conditions and ailments that we experience. For the record, for the past 12 years, 8 million children deaths were related to the vitamin A deficiency, and over 1 billion people across the globe are dealing with vitamin D deficiency. Therefore, it is very important that you notice these deficiencies on time, and start treating them before they develop some serious disease or some health complication. This symptom is mostly related to the lack of sleep, but puffy eyes may also occur, due to the deficiency of iodine in our body. The iodine is the one that is getting rod of endocrine disruptors such as bromine, chlorine and fluorine. 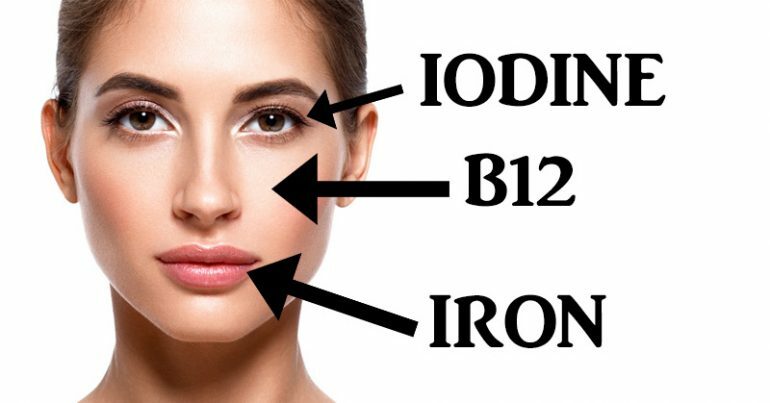 Also the iodine is helpful in the function of our thyroid, and it is able to treat puffiness. Therefore if you want to lower puffiness, try to reduce the intake of salt. You should also consume more beans, sea vegetables, pastured eggs and kefir. Consume sea veggies like kelp, wakame, and dulse. Mostly the deficiency of iron is demonstrated with pale lips. According to the Centers for Disease Control (CDC) the iron deficiency is one of the most common deficiencies in the U.S. Therefore if you want to maintain your levels of iron, you should increase the consumption of more green leafy vegetables like spinach, and some other foods such as spirulina, raisins, dark chocolate and lentils. The lack of vitamin C in our body is demonstrated by bleeding gums. Also the vitamin C deficiency is causing swelling in our joints and nosebleeds. If you want to prevent from this, increase the consumption of foods that are rich in vitamin C.
If your vitamin B12 levels are very low, your skin might become very pale, and this condition is very likely to be followed by fatigue. So if you want to elevate your levels of vitamin B12, you want to increase the intake of raw rennet-free cheese and pastured eggs, or just take supplements. The dandruff, brittle and dry hair are mostly a sign of vitamin B7 and Biotin deficiency. It would be wise to start consuming mushrooms, green peas, nuts, sunflower seeds and legumes.